A 15-year-old boy has succumbed to injuries sustained after being struck by a tree near Clayton Heights Secondary. Oct. 14, 2016 10:00 a.m.
A 16-year-old boy has died after being struck by a tree near Clayton Heights Secondary. 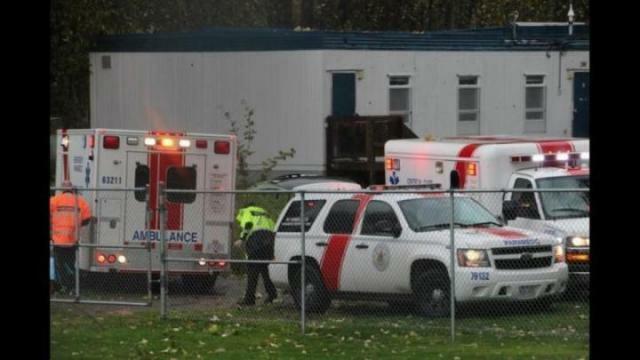 At 2:24 p.m. Friday, emergency crews were called to a wooded area by the school, at 6965 188 St. They found the boy in serious condition after being struck by a tree, which toppled during a wind storm. Firefighters initiated “first responder protocols” according to Deputy Surrey Fire Chief Larry Thomas. Fire crews continued medical assistance on route to hospital. However, the boy succumbed to his injuries once he had arrived at the hospital. Surrey School District spokesperson Doug Strachan said Friday the final bell had gone and kids were heading home. They had been warned to stay away from treed areas because of the high winds. Strachan said extra counselling would be available to kids when they return to school on Monday and that the school’s website would be updated with pertinent information. Fire crews were incredibly busy on Friday as winds and rains took down trees, which in turn knocked out power. More than 12,000 homes were without power in the Surrey area on Friday afternoon.